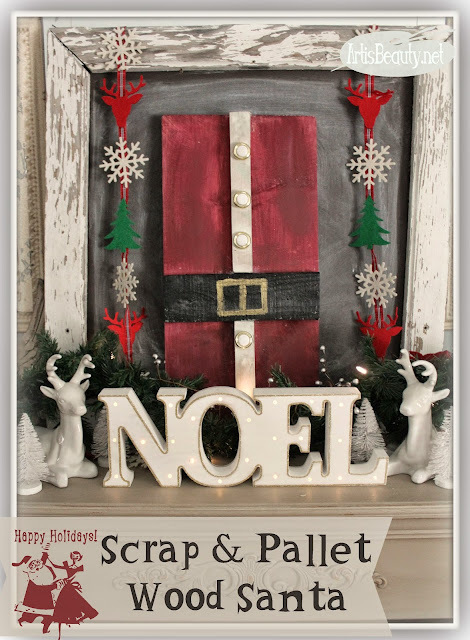 ART IS BEAUTY: Use what you have Pallet wood Santa Art. Use what you have Pallet wood Santa Art. I have a fun little Christmas Craft for you today. I tend to collect lots and lots of wood scraps. build a back for another piece of furniture. They are just bits and scraps..
if you should just let the hubby burn them in the fire pit. another project and a small piece of pine left over from another project. Now I could have made a sign or something out of the pine, but I wasn't feeling it. and my no means was going for perfection. So I just quickly painted my board with a red craft paint. for Santa's belt and coat front. I screwed my pallet wood on and then painted. But for the coat front I wanted to give it a little something EXTRA. Before my Mom left for Florida she gave me a bunch of old hardware she had laying around her condo that she had never used. She is like me. She saw them on clearance and thought..I should buy these in case I need them. I drilled holes for the BUTTONS on Santa's coat and counter sunk the knobs to make them look like buttons. Screwing them in from the back just like you would a drawer knob. Once those were in I just painted on the black belt and painted a gold buckle on his belt. and there you have. A super simple.. Scrap wood and pallet wood Santa Art. Nothing crazy but fun non the less. is happy to see my stash get a little bit smaller! I hope you enjoyed this fun little craft! It might be a fun little SNOW day activity for you and your kiddos too. So many things you could do..Mrs. Clause...and Elf....You name it.. If the SCRAP WOOD is endless then so are the Possibilities! for our TWIRL and TAKE A BOW link party. To show what YOU have been working on .